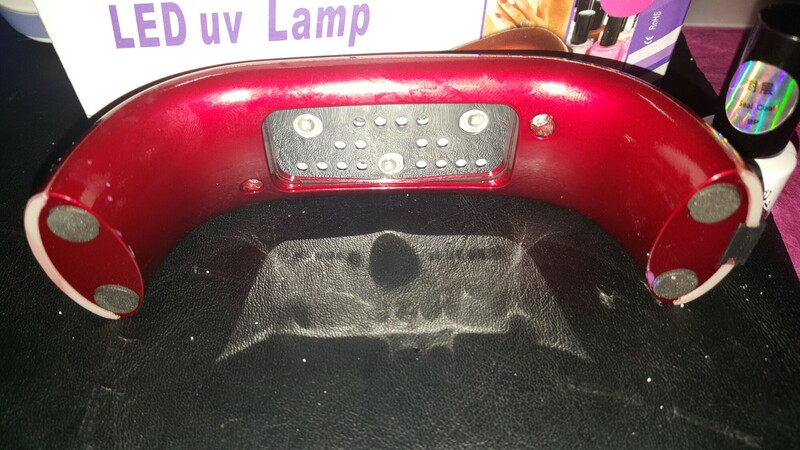 Watch “My New LED Nail Lamp frm Amazon ~ReChargeable w/3Level Lighting” on YouTube! 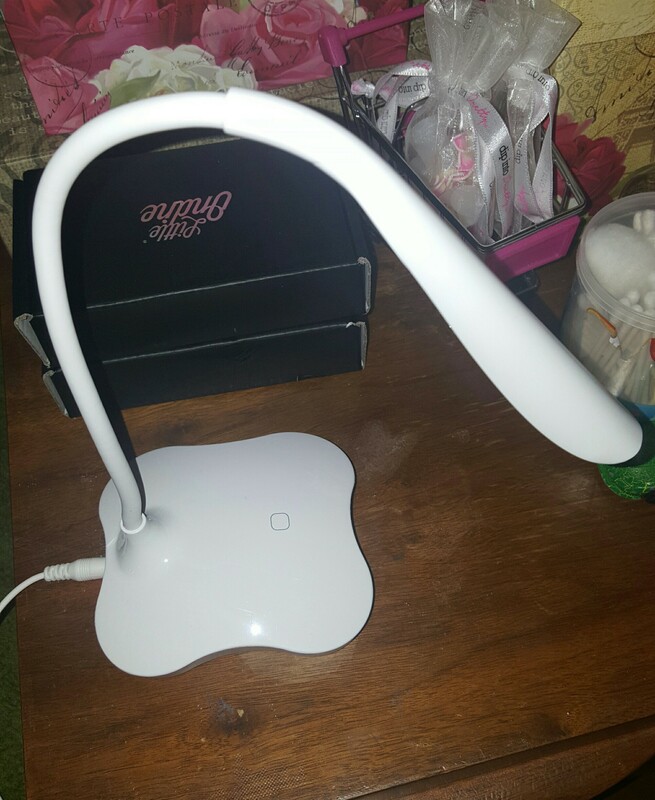 This is a really nice Lamp to have for doing Nails especially in Dim Lighting.I like that it’s super flexible & has 3 lights setting!More Details in the morning Description Box Under the vid! Be sure to Subscribe to my YouTube Channel,Thumbs Up & Click the Notification Bell for new Vid Uploads!TY! I was sent 6 Shades of NAWE Polish to try&the colors are beautiful. Some are thin formulas some were nice&thick.The colors are bright with an Ok Shine to them. I swatched all 6colors on my Bundle Monster Lotus Mat. Watch My Mat Swatch&Unboxing vid (The Box it was shipped in needed a vid of its own!=) On my YouTube Channel. Be Sure to Subscribe! All info for the Polish is in the description box under the video. 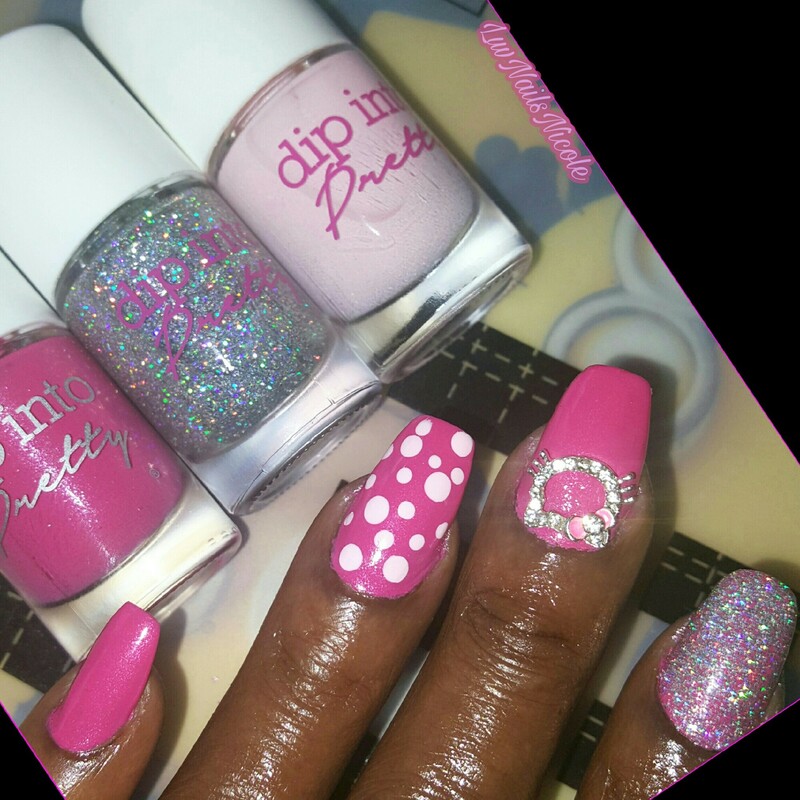 New Polish By Dip Into Pretty! I forgot to Share my St.Pattys Day Nails! 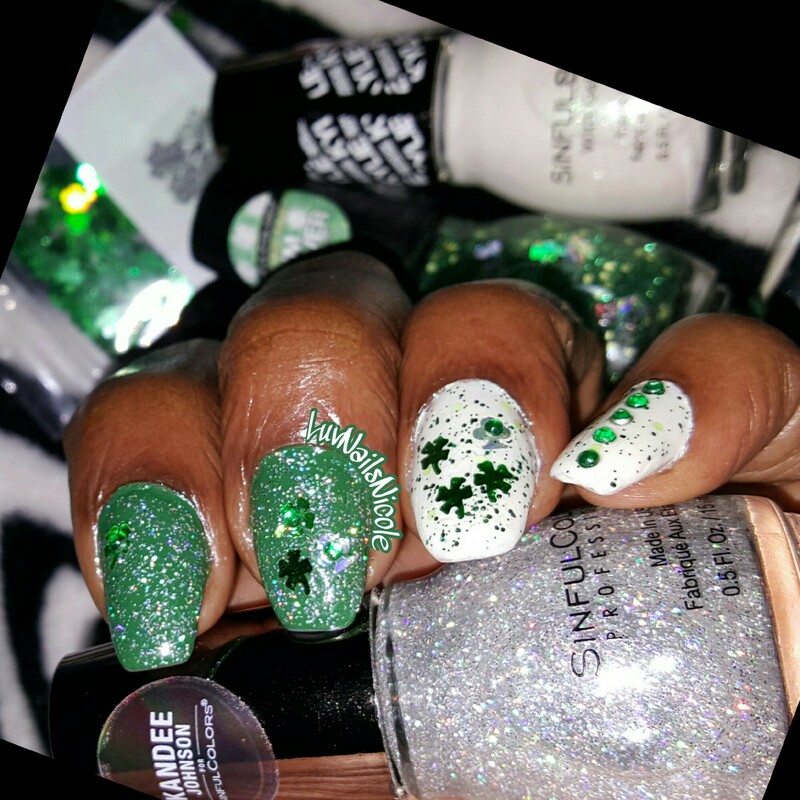 Using SinfulColors “IM CLOVER IT” Glitter w/Holo Clovers and Dark & Light Green Round Glitters “KOVET” A White Shimmer w/a Hint of Green from the KING KYLIE Signature Kollection. 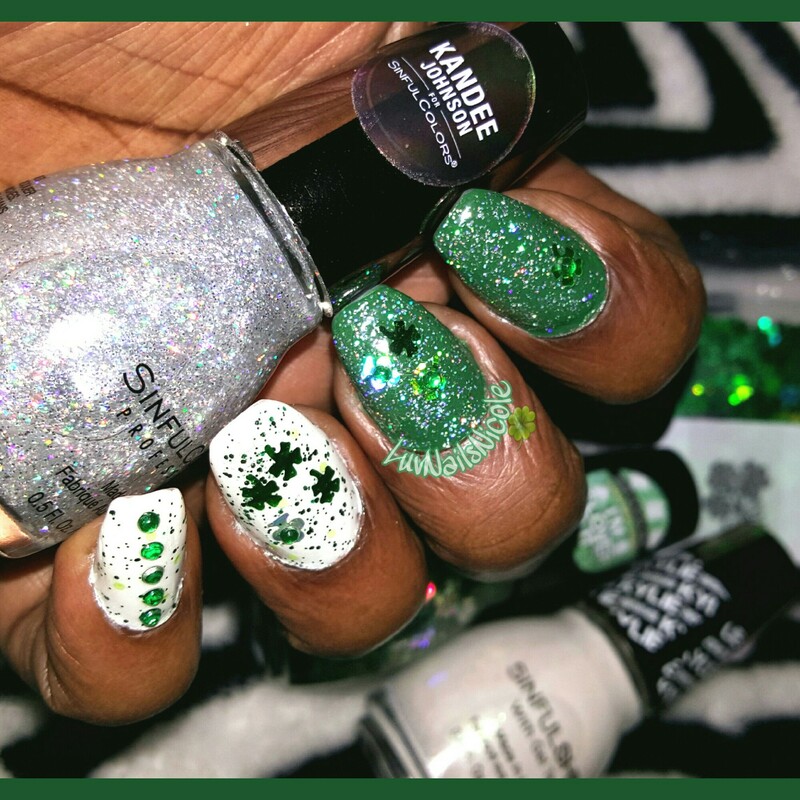 “EVERGREEN” 8Free Polish By LOOK NAIL COLOR &I went over the Green Polish w/ “URBAN MAJIC” from SinfulColors KANDEE JOHNSON COLLECTION .Then I added the Green Clover Glitter Pieces frm “VINAILICIOUS” & Green Rhinestones to finish off the Look Topped w/ SecheVite Fast Dry. 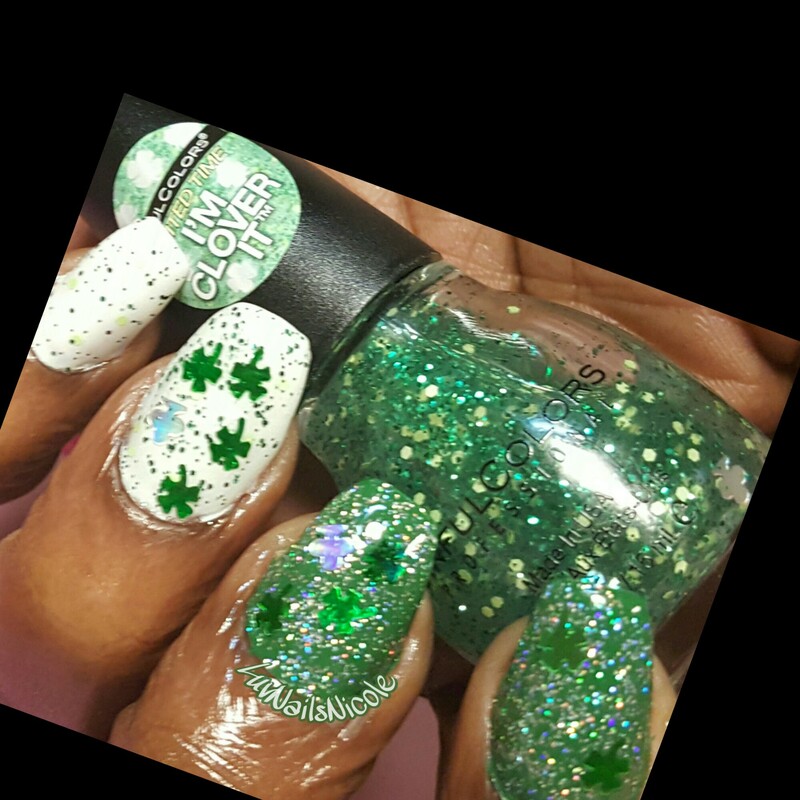 With The “Im Clover It” I had to fish out the Clovers.There is alot in the bottle but i could barely get 1 out so I only used 1 holo clover frm the bottle on 2nails.The small glitters came out fine. 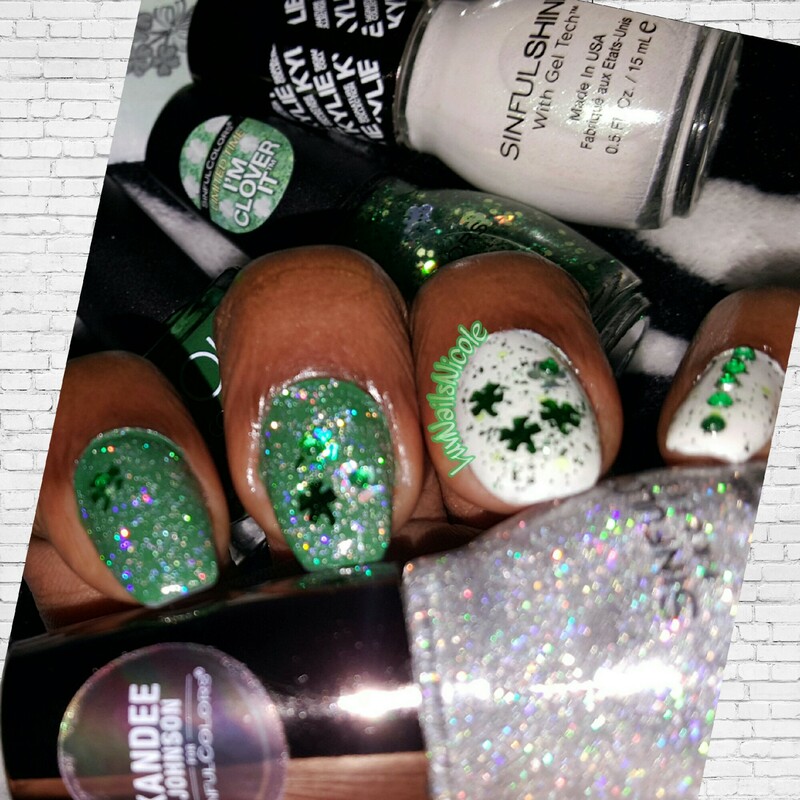 The “Kandee Johnson” is a Must Have!It’s Beautiful & Goes on Thick.Lots of Glitter comes out on the brush.I think i did 1coat,maybe2 &I luv the hint of green in Kovet. I received all items pictured to Try&Review from HARUNOUTA STORE. 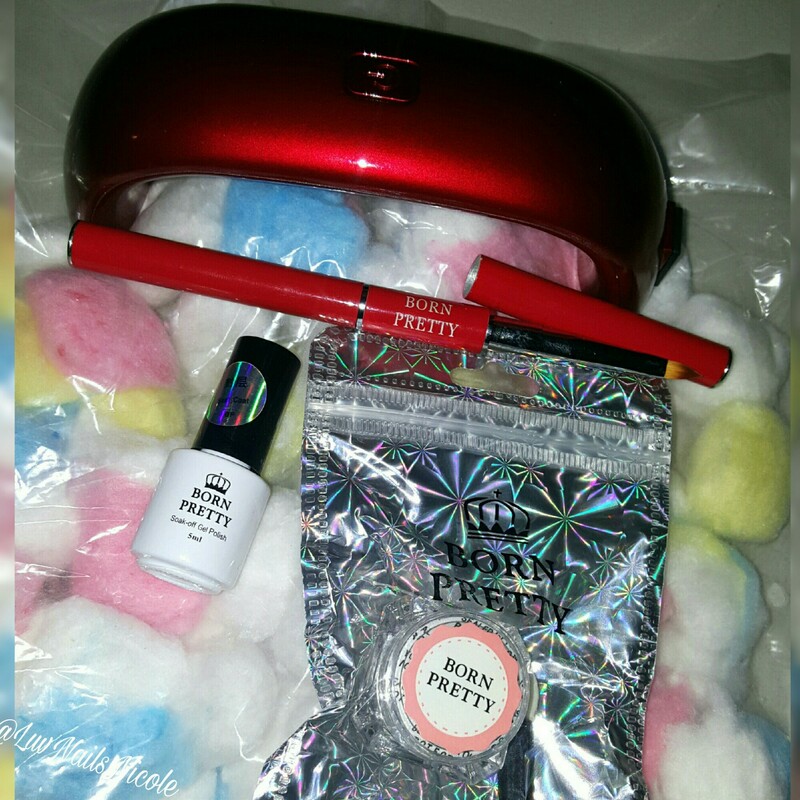 I was able to Pick My own items so i chose,LED/UV Mini Gel Lamp, BornPretty Soak-Off Gel Topcoat, Red Nail Art /Acrylic/Gel Brush ,Light Purple Chrome Powder &a bag of Colorfully Mixed Cotton Balls. I have to talk about this Red Mini Gel Lamp. It had me so flustered! I used it on a Mani I did for my mom&my mom n law. At the time i only had 1 Gel Polish that I purchased just to test the lamp.I was never really interested in using Gel due to all the steps that has to be done but I am ready to give it a try since I’ve learned a few more things. I used GELAZE By China Glaze. I Had to turn the lamp back on after the few seconds it stays on to cure at least 10times.It stays on 15-20secs.Sometimes less,Sometimes longer. The more i had to turn it back on the less time it stayed on. The Gelaze is supposed to cure in about 30seconds-2minutes I think. It took me at least 20mins Or Longer to Get it to Cure! !After that the Polish either disappeared (only way I can explain it)It went frm thick to watery Or it started running down the finger while curing&I had to apply another coat then cure again to make it look decent. I’m assuming the lamp wattage isn’t strong enough(there is only 3 lights underneath)The lamp is so small,My phone is bigger than it!It also didnt come w/a U.S Plug that fits in to outlet so i had to use an Extra cell phone wall adapter. I Give This Lamp 2 Thumbs Down.Im so glad I did not purchase it because i was actually going to awhile back thinking it was cute&affordable! 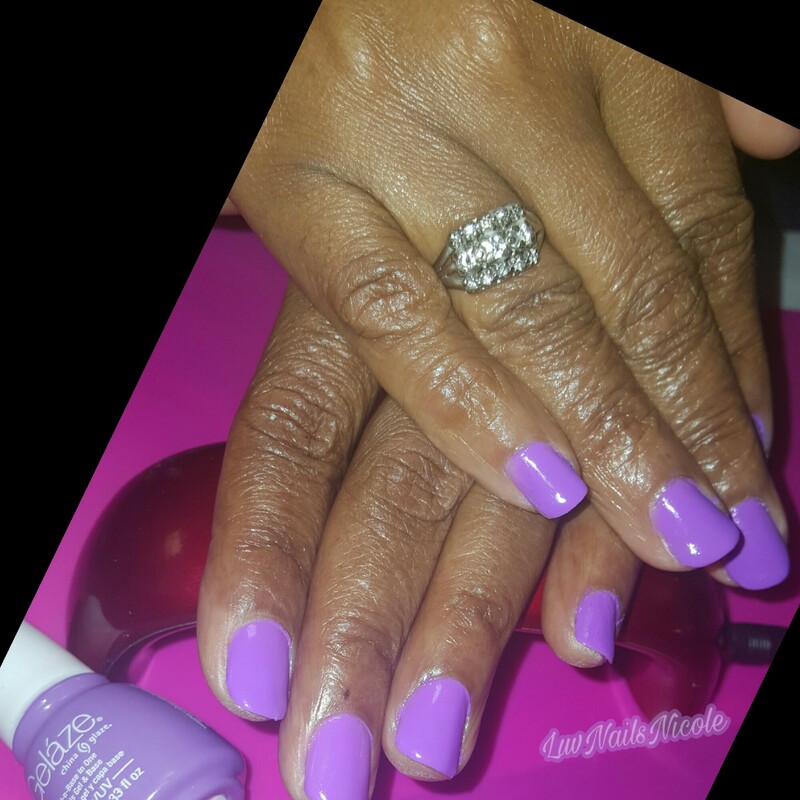 Pic of my Mom-n-Laws Nails w/ “IT’S SHORE BRIGHT” Gelaze. I have not used the Chrome Powder yet but will post when I do.Im actually waiting til get anothet lamp. 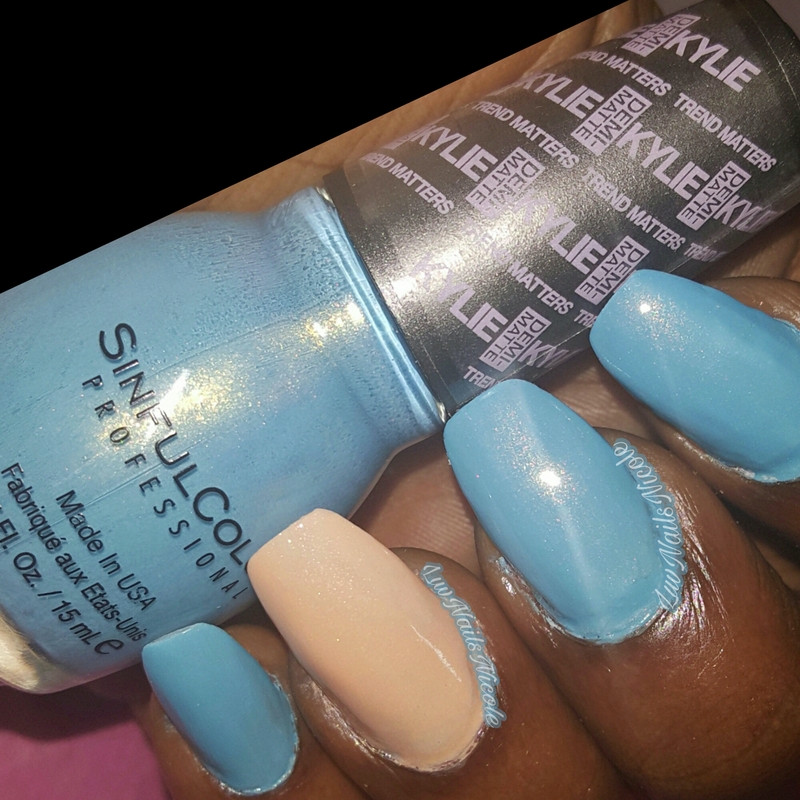 The Cotton Balls were smaller than I expected&not very many in the pack.I only picked it because I liked the colors lol but I need at least 3-4 to take polish off 1nail&3 in my Cotton Claw to clean Stamp Plates.The Brush is a Nail Art Brush but it’s also good for cleanup.I want to say it’s a #6. 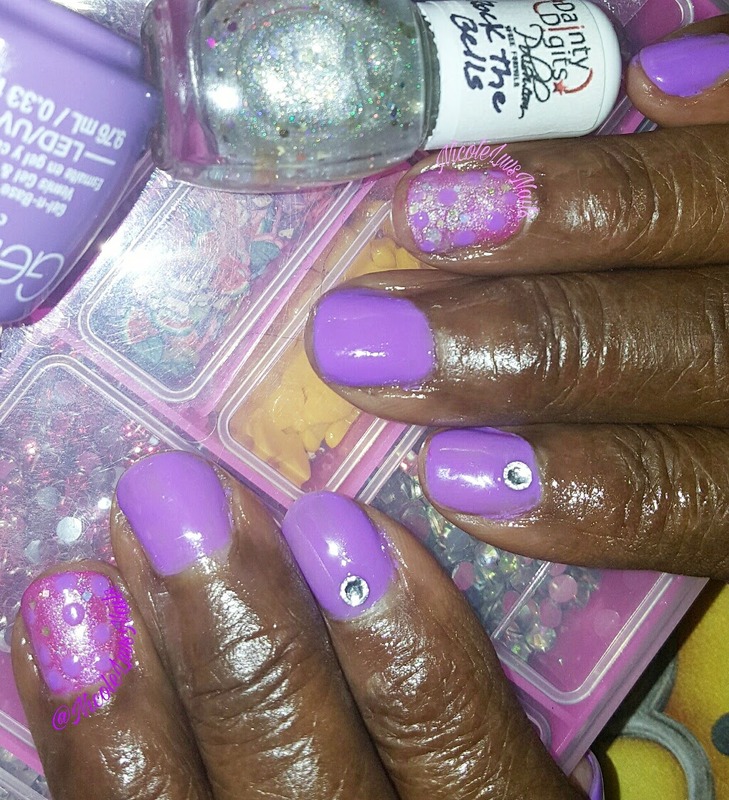 Pic Below is my Moms Nails.I added a drop of the BornPretty Topcoat&Stuck the Rhinestones in it.Then went over it w/another coat & cured it 500hours to get them to stay Lol. Read Below For Discount Codes&Links!Thanks for Reading! 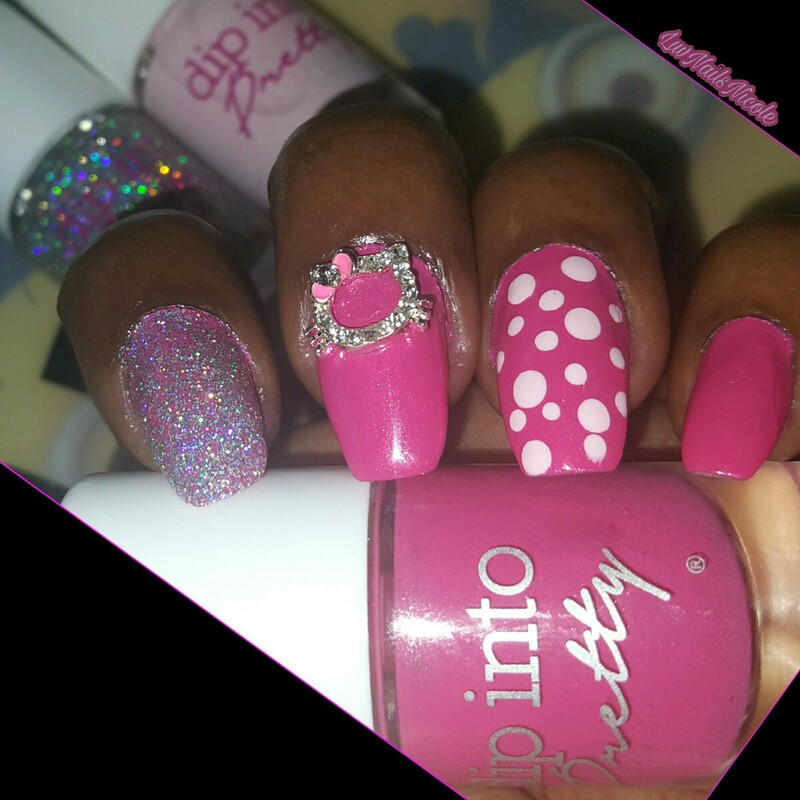 At http://www.bornprettystore.com Use Code “LUVX31” For 10% off any Non-Sale Items. Both Sites Ship WORLDWIDE! (Non Nail Related) For Hair Care Styling Tools Check out http://www.duvolle.com &Use Code “LUVNICOLE” For 70% off any saying tools that will include a free Detangler Brush.I will post a blog on the items I have. 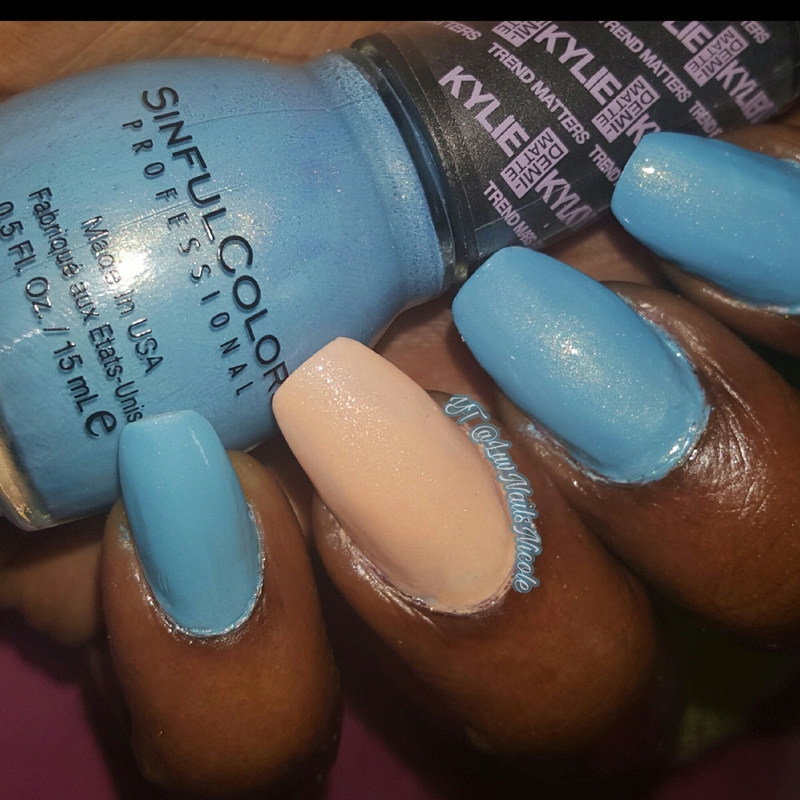 I wanted to use some of my Un-Trieds &I picked 3 SinfulColors from the Kylie Jenner Collection. I found them on clearance at Walgreens for $1.49 last year. I luv this color combo,the colors are so vibrant&pretty. KURTAIN KALL is a Demi-Matte w/a hint of shimmer. V.I.PEACH is a Shimmer-Matte Both frm the Trend Matters Collec. I wasnt sure if i was gonna like the peach with my skin tone but i actually like it alot. 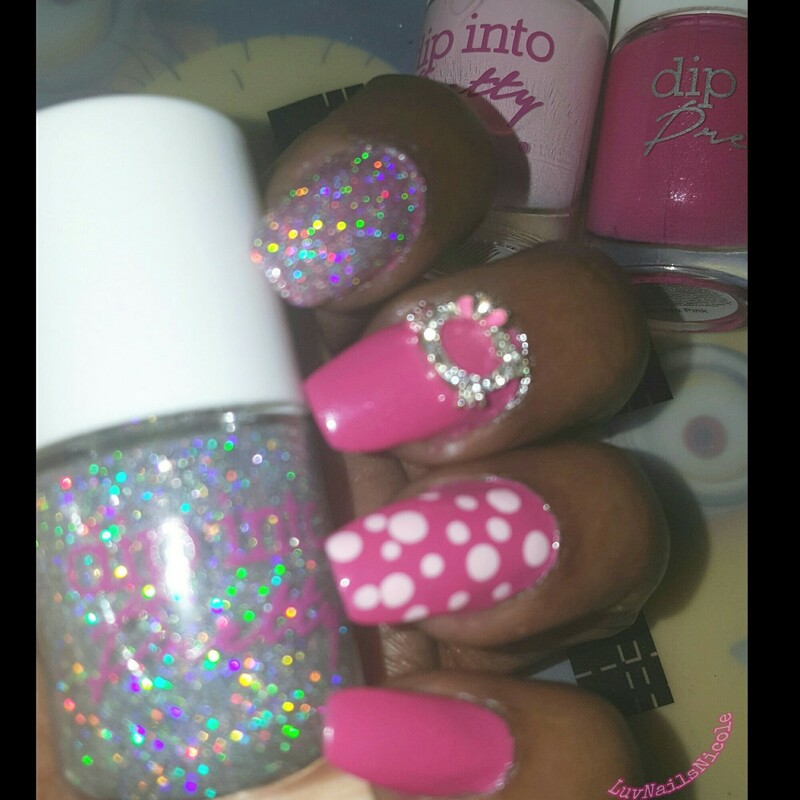 I topped off the look w/ KONFECTION a Glitter Matte. They are all Thick Formulas so I only needed 1coat even the Glitter was a 1coater! I didn’t want the matte look so I went over it w/A Clear Topcoat& My fav ScratchofSweden.us Fast Dry TC. 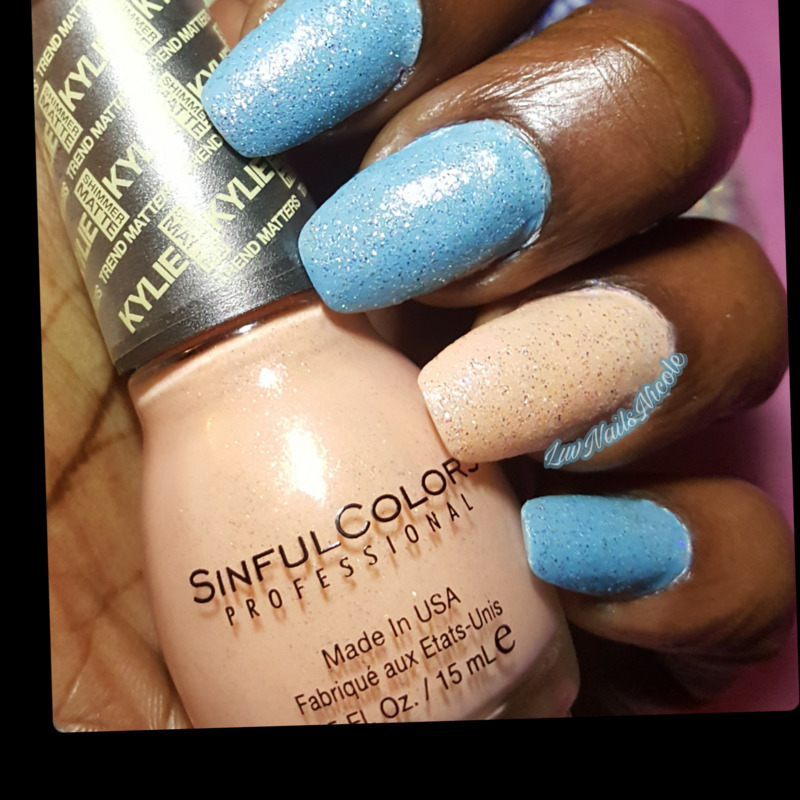 Pic below is without a topcoat over the Glitter Just to show the look of the Matte Finish.This Glitter has beautiful colors in it&its really sparkly matte or non-matte.I was really surprised that i only needed 1coat.Most glitter toppers you need 2-3 of more.